When I quit dieting, there was a lot of leftover guilt about overeating because I was taught that eating the fewest amount of calories was “good” and overeating was “bad”. It was all very black-and-white. When I shifted from dieting to intuitive eating, I had to wrap my head around the idea that IE doesn’t have any rules. Overeating is not “bad”; it is just part of the eating experience. There is nothing inherently wrong with overeating, which meant that I could finally give up the idea that it was “bad” to eat beyond fullness. That all sounds great in theory, but putting it into practice was not so easy. My self-bully would often come after me and berate me for eating too much. Deborah, look at what you did! You should know better than to eat that much. Now you’re going to get fat! Treating myself this way was unacceptable and I knew that in order for my mental health to improve, I had to face my self-bully head-on. My cruel inner voice and I had some fierce word battles, but it was important for me to continue to fight it. Silencing this voice took a tremendous amount of mental effort, but it did slowly fade. Normal eaters overeat. Thanksgiving is a perfect example of this. Naturally intuitive eaters eat more than usual on this day. They may have to loosen up their belt buckles a bit, but it doesn’t faze them. They just may have a lighter meal later on because they’re less hungry. This applies to non-Thanksgiving times too. It’s okay to eat when you’re not hungry. There could be a celebration at work where you aren’t hungry but want a little cake to be part of the community. 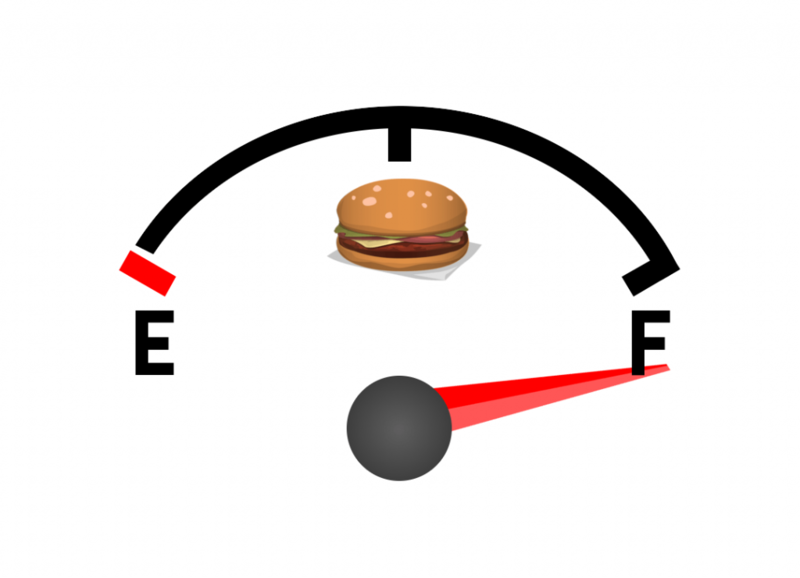 This can lead you to feel like you overate, but remember that IE doesn’t have any rules. It’s perfectly fine to eat for social reasons. It is also okay to eat past full simply because the food tastes damn good! One thing I’ve done is to allow myself to eat past full a few times…but mindfully. When I brought mindfulness into the experience, I was able to stop after a few more bites and avoided feeling physically uncomfortable. Sometimes you might eat emotionally and it can turn into overeating. Again, this isn’t a bad thing. You are trying to deal with your feelings and this is the coping tool you currently have at your disposal. Use this as a learning experience and consider other coping skills that can meet your emotional needs in the future. You many unintentionally overeat if you are eating around a craving. When I started IE, I gave myself pseudo-permission to eat, so I still had forbidden foods even though I tried to convince myself otherwise. I tended to overeat when I was physically full but wasn’t satisfied because I denied myself what I really had wanted. I would then seek out food to satisfy my craving which caused me to eat past fullness. The lesson that I learned? Eat what your body craves. There’s a reason for it! When you overeat, there usually will be more time between when you ate and when you’re hungry again. That’s your body’s way of saying that it has enough fuel to sustain you for a longer period of time. When you eat past fullness, consider your mental reaction. Let’s look at two different versions of your inner voice in this situation. I ate a little past fullness. It’s neutral and non-judgmental. You are stating a fact and that’s it. Done. I was bad for eating too much. The addition of “bad” can quickly spiral into guilt which can lead to the emergence of your self-bully. The best way to squash that negative inner voice is to acknowledge the event and let it go.2 You overate. It’s not like you burned down an orphanage or clubbed a baby seal. Although I have already stated this, I feel it bears repeating if you’re new to IE: It’s normal to overeat! That means that you will overeat at some point…and that’s okay! If you do overeat, don’t beat yourself up. Instead, call upon your non-judgmental voice and give yourself a little slack. Using this type of voice is often a challenge because you’ve done the opposite for so long. You will have to retrain your brain to go from automatic negative thoughts to neutral or positive ones. It’s tough! Just remember that IE is a learning process and it takes time to be comfortable with normal eating, which includes overeating. How do you react when you eat past fullness? Please share in the comment section below. 1More on this in “Help! I Can’t Stop Eating!” (coming soon)! 2Did Frozen automatically pop into your mind?